Implementation of biomimetic processes and organisation is the basic principle how to create innovative bone substitution materials. 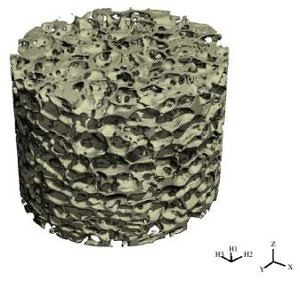 Synthesis of cellular structured materials with hierarchic porosity is intimately connected with the medical requirements on bone constitution materials. 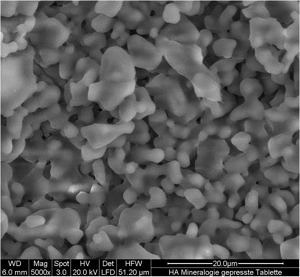 The striking advantage of nano scaled microporous calcium phosphates (CaP), which are organized within another macroporous system (Ø 0.1 to 1 mm), is correlated with their excellent resorption properties and accelerated in vivo bone formation. 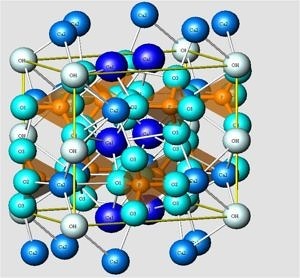 Phase composition of CaP-powders, CaP-ceramics and hydrated CaP-cements are quantified by the Rietveld refinement of XRD data. 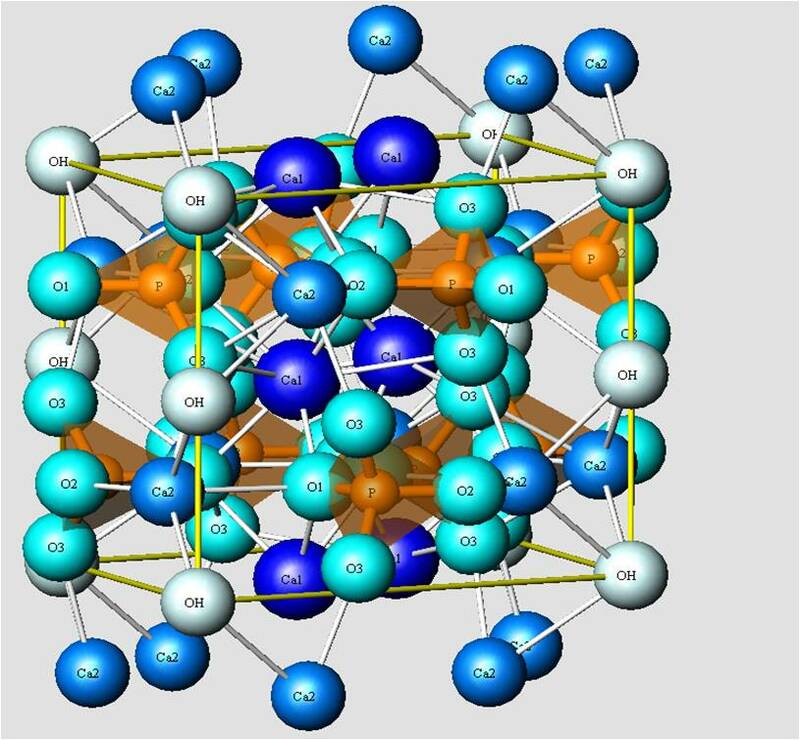 The link between mechanical strength and mineralogical phase composition is investigated. Influence of biocompatible additives on the hydration and strength is analysed with a combination of heat flow calorimetry and in-situ XRD at 37°C (body temperature). HAp structure after Wilson et al., 1999, Am. Min. Development and improvement of bioactive materials for implantation with optimized physiological compatibility, functionality and high potential for bone regeneration (osteoconduktive biomaterials) are in focus of the cooperative research activities within groups from technical, medical and natural sciences at the University of Erlangen. The produced materials are based on the fundamental idea of biomimetically controlled material organisation. 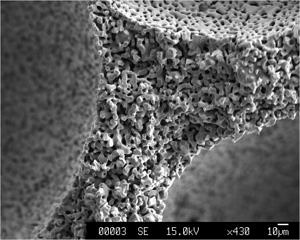 Bioactive ceramic materials with hierarchically structured pores are synthesized (Mineralogy Group) and the surfaces with layers of osteoconductive substances modified (Material Sciences Group). This structured and functionalized bioactive cellular biomaterials are investigated with respect to cell mechanics and processes between the organic cells and the inorganic material (Biophysics Group). The aspects of the organo-matrix-interaction of porous implant materials is evaluated in-vivo with different reserach groups of the university hospital (Oral Surgery Group, Plasitc Surgery Group, Rheumatology Group) with the aim to further improve biofunctionality. 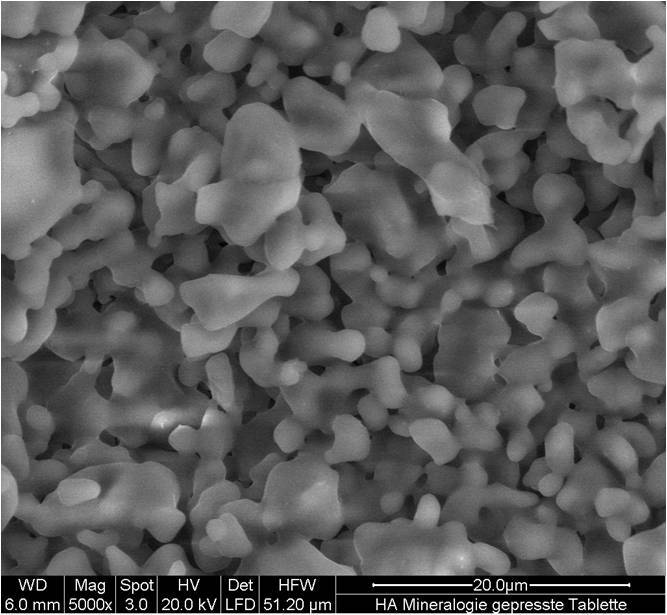 Calcium phosphate cements (CaP-cements) constitute a special group of bioactive bone substitute materials with unique properties for bone regeneration, due to their injectability and in vivo setting ability. CaP-cements consist of different calcium phophate minerals, which set after mixing with a liquid and their application or injection in the bone cavity. The material is mouldable, and therefore can adapt ideally to the defect morphology, presenting a good fixation and an optimum tissue-biomaterial contact, necessary for stimulating the bone ingrowth. CaP-cements are very good resorbable, with a resorption rate which depends on their composition and microstructural features. The end-products of setting are precipitated hydroxyapatite or brushite depending on the pH of the paste. Within the topic of further improvement are functional additives (e.g. polysaccarides, amino acids or growth factors) which optimize setting behaviour and clinical performance. 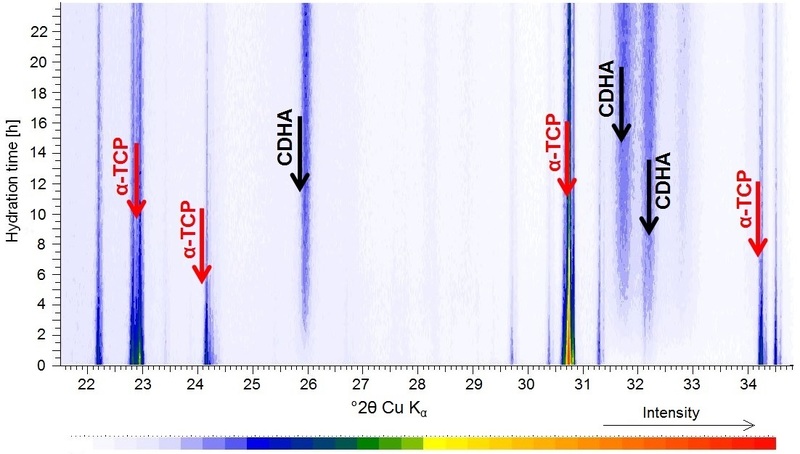 The focus of our investigations is put on hydration behaviour of the alpha-modification of tricalcium phosphate (TCP) with different cations substituting for the Ca ion. Synthesized CaP cements are investigated by heat flow calorimetry and with in-situ XRD of phase formation during setting at 23 and 37°C. 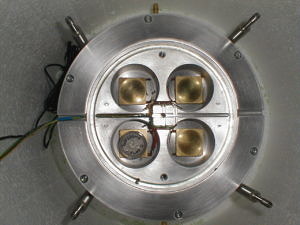 In-situ XRD of alpha-tricalcium phosphate (alpha-TCP) hydration under formation of calcium-deficient hydroxyapatite (CDHA).